Decades of occupation coupled with severe restrictions on the movement of people and goods have undermined the living conditions and reduced access to livelihoods for Palestinians. Food insecurity is mostly due to a lack of economic access: food prices are mainly driven by Israel and out of reach for many poor households – the GDP per capita in Palestine ($4,700) is six times less than that of Israel ($30,000). The impact of the 2014 conflict in Gaza continues to be devastating to the Palestinian people and economy. Against this backdrop, more than 27 percent of the population—or 1.6 million people—suffers from food insecurity. In Gaza, one in two is food insecure, and one in three is severely affected. As poor and vulnerable Palestinians spend more than half of their income on food, WFP’s assistance is critical to meet their food needs. This prevents further deteriorations in food security and livelihood status, and avoids the use of negative coping mechanisms. 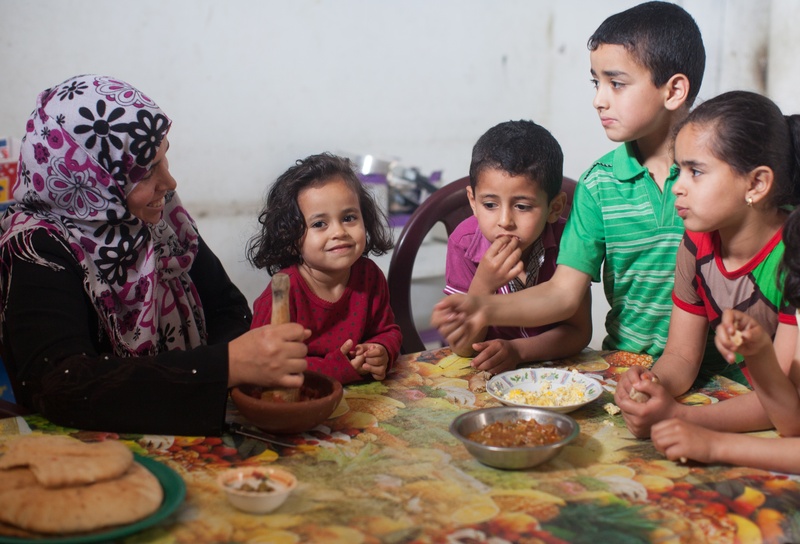 WFP targets 600,000 of the most vulnerable, food insecure non-refugees in Palestine who have been affected by the ongoing conflict and occupation, a fiscal crisis and a steady decline in living standards. WFP’s work combines ongoing operations in the West Bank and Gaza to address urgent humanitarian needs in Palestine, while supporting early recovery and sustainable, long-term food security for non-refugees. WFP has been present in Palestine since 1991. General food assistance – WFP works to meet the food needs of the most vulnerable non-refugee populations. Cash, food vouchers or e-cards are used by humanitarian and development actors to deliver their own or complementary assistance with WFP’s One Card. During the 2014 Gaza conflict, WFP and OXFAM reached 300,000 people in two weeks with this voucher. In May 2016, WFP assisted 481,000 food insecure people in Gaza and the West Bank through in-kind food and food vouchers. This included 30,000 members of the vulnerable Bedouin and herding communities living in Area C of the West Bank. Nutrition – To strengthen the nutritional impact of its CBTs, WFP together with OXFAM, UNICEF and local NGO Ard El-Insan run a nutrition awareness campaign for 2,500 women and 1,000 men receiving food vouchers in Gaza. Interactive sessions have been instrumental to strengthening women’s role as autonomous decision-makers and promote a common understanding of the importance of healthy eating. The program is all the more critical as 50 percent of the population suffers from more than one micronutrient deficiency, particularly female adolescents in Gaza where 72 percent are deficient in vitamin D and 64 percent are deficient in vitamin A. Since 2011, 4,850 women and their families have benefited from the training. Enhancing resilience – WFP fosters early recovery and enhances the resilience and coping mechanisms of fragile communities in the face of economic hardship and restricted freedom of movement. Social safety nets – WFP supports the Palestinian Authority’s (PA) national safety net by strengthening government capacity.